Final Night Short Stories "Soft Cover"
Love and death and the passage between entry into the world and exit from it are the focus of this collection of short stories. Buthaina Al Nasiri is an Iraqi author who has lived in Cairo since 1979. Despite this physical and temporal distance from her homeland, much of her material derives from it and many of the stories in this collection reflect her deeply felt nostalgia for Iraq. In contrast to many contemporary female writers, she confesses to being less interested in the position of women in society than in that of people in general and the sufferings they experience between birth and the end of life. None the less, some of her best stories depict the many-colored relationships that exist between the sexes. 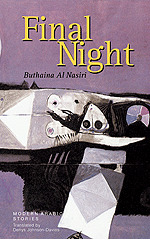 Buthaina Al Nasiri’s work has been widely translated into European languages, but this is the first volume of her stories to appear in English, for which renowned translator Denys Johnson-Davies has selected work from a career of short-story writing spanning some thirty years.